I’ve tried both the Buster Cube and the Kong toy with my dogs. They both dispense treats as your dog plays with them. While the Buster Cube definitely has its place and time in our home, my dogs generally prefer Kong toys most of the time. In the 1980’s, I purchased the Buster Cube for my dog. It was quite a novel idea at that time… a dog toy that could also dispense treats! Since this was back in the day before Kongs had really caught on big, everyone who saw my dog playing with the Buster Cube wanted one for their pet. It’s more like a game for your dog. He has to physically nudge and roll the large cube with his nose in order to get the dog treats to fall out. So it’s an interactive dog toy that’s never the same experience twice. It’s more challenging than a Kong toy because it only provides intermittent reinforcement. There is zero reward unless your dog manages to push the Buster Cube with enough force (or in the right direction) that makes the dog treats dislodge and fall out. Whereas a Kong toy provides immediate and constant reward with every lick. With the Buster Cube, the dog treats are dispensed according to your dog’s determination and the amount of time he spent playing with the toy. You can even regulate the degree to which you want the treats dispensed, depending on if you want more treats to fall out with gentle nudging or fewer treats. It’s durable and long-lasting. As I said, I got mine in the 1980’s and I still have it. It has survived regular use from all 3 adult dogs that we’ve raised since the 80’s. (My dog just played with it yesterday and had a great time.) On the other hand, Kong toys, since they’re made of rubber, tend to wear out after a few years. The opening where you insert the dog treats starts to break down first — it becomes tacky and begins to disintegrate. 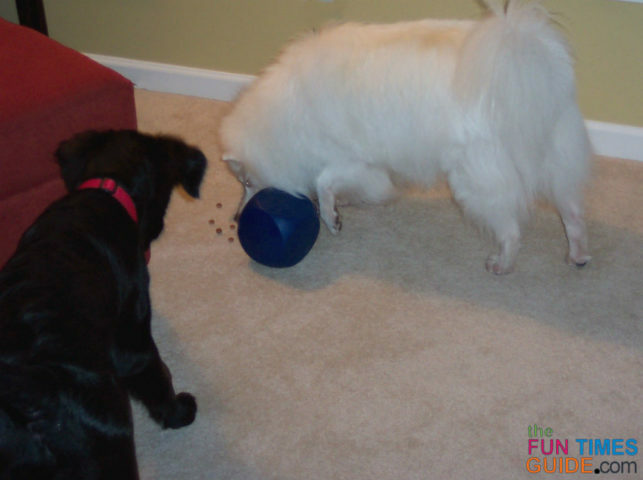 Here are some tips for using a Buster Cube to mentally exercise your dog. 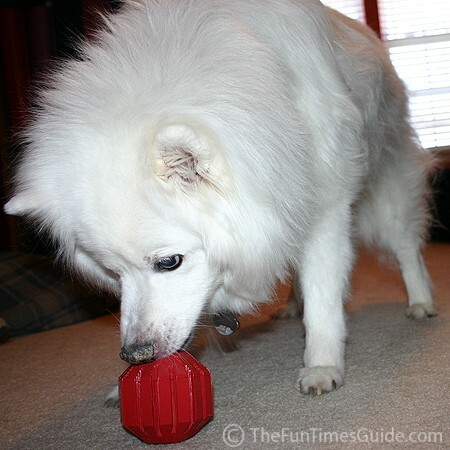 After having the Buster Cube for a few years, I later discovered Kong dog toys — mostly after hearing everyone else raving about the effectiveness of Kongs as chew toys and as treat dispensers. It accommodates the use of hard and soft treats, as well as wet and dry treats. You can’t use soft treats or wet treats inside a Buster Cube because there’s no way to clean out the inside. It can only be filled with dry dog kibble. On the other hand, a Kong toy can be filled with anything — hard or soft, wet or dry! 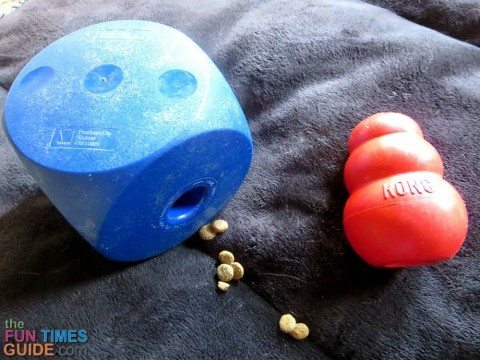 Here are some dog recipes that work great in Kong toys. It can literally be chewed on for hours — even years — without destroying it. The Buster Cube is too big to fit within a dog’s teeth, so there’s no real chewing or mouthing on it at all. It’s made of a durable, bouncy rubber, so your dog is encouraged to toss/roll/throw it around. On the other hand, the Buster Cube is made of hard plastic and it could possibly crack if dropped, kicked, or thrown hard enough. It comes in lots of fun shapes, sizes, and “toughness levels” — so the possibilities are endless when it comes to stimulating all sizes and ages of dogs for hours on end. 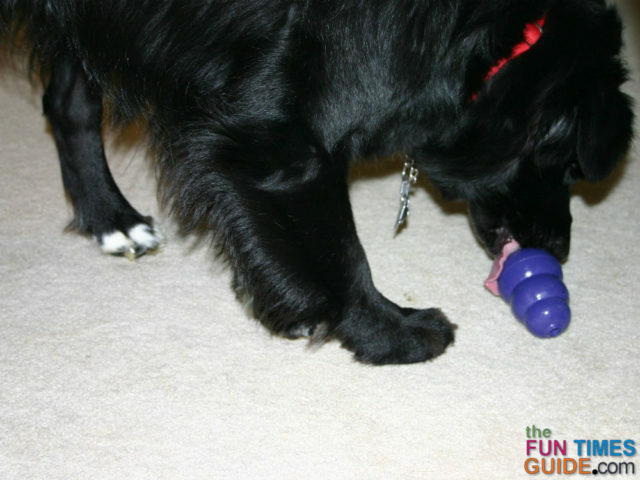 Here are all of our best tips for using Kong toys.